We finished up our Christmas shopping today and bought cemetery flowers for our parents. Then after lunch we took our great nephew Jordan down behind the barn to find his annual Charlie Brown Christmas tree. The only requirement for the tree is that it has to be his choice. Everybody else's job is to try and persuade him to get one that if fuller with more branches. It's a game we play every year. But he has a gift for choosing the saddest tree, the one that Charlie Brown would choose. It's a good way for everyone to tramp around in the woods and burn off lunch. It's a fun tradition that we started with his mom twenty years ago. Below is a picture of Jordan and his Charlie Brown tree. 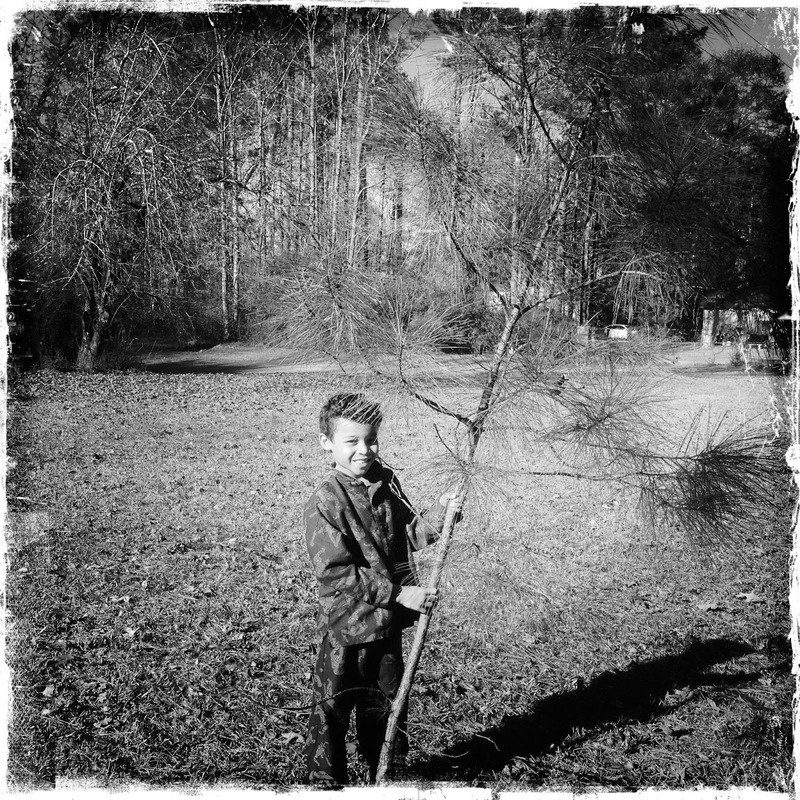 Both Jordan & his tree are precious!! Jordan is going to treasure that photograph when he's all grown up. A few decorations, and that will fill right out. You won't recognize it. Can't beat finding your very own tree! What fun ! Look at the pride on his face. I would love to see an untouched color photo of Jordyn and his decorated CB Christmas tree. The tree is a lot taller than I thought it would be. He'll need some good imagination to decorate that. Love it! It will surely be fun decorating it together. That's adorable. I love your tradition. The saddest looking tree is the one that gives back the most love. Jordan knows what he is doing.